After the rumors of Apple going for iOS 7.1 Beta 4 release for iPhone, iPad and iPod Touch, the update has just been released! BGR has a mixed track record of breaking rumors, but seems like it has hit the right spot today! Apple has just seeded iOS 7.1 beta 4 to developers after the rumors hinted its launch tomorrow. 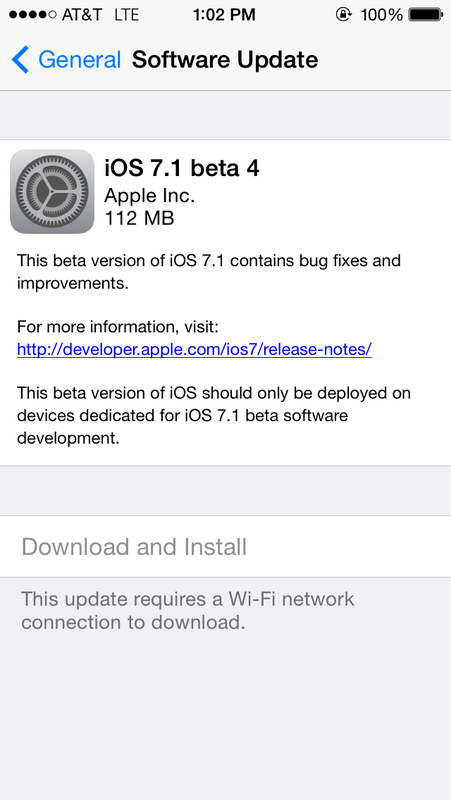 You can download the iOS 7.1 beta 4 from iOS Dev Center. As always, beta updates are only available to registered members at Apple’s developer portal. The update is available to be downloaded via over-the-air; the size is 112 MB and the build number is 11D5134c. With this fourth beta release of iOS 7.1, the time of public release comes nearer as not more than five to six beta releases are seeded out. This iOS 7.1 beta 4 release offer the usual bug and crash fixes. – Apple has also released Apple TV beta 4 and Xcode 5.1 beta 4. – 32-bit apps running on a 64-bit device cannot attach to BTServer. Messages no longer indicates a send failure immediately after sending.